Ferrite alternator turbines 2m or 4m rotor diameter are the wind turbines mostly built in PureSelfMade workshops or projects, although other sizes and types have been built too. They are all based on the Hugh Piggott design. The turbines are mainly constructed following Hugh Piggott’s plan, although minor modifications are made. A German translation of the Construction Manual is currently being written up by PureSelfMade & Hugh Piggott collaboratively. 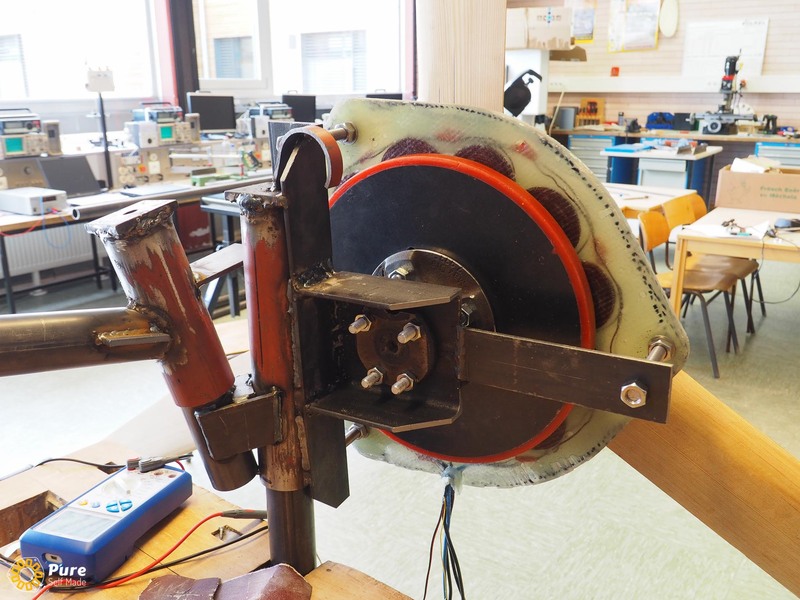 The “F” machines have ferrite permanent magnets in their generators. Why? You might ask, since they are weaker than high-end rare earth neodymium magnets!! While that is true, they have some great advantages too: They are much cheaper than neodymium magnets and because they are based on ceramic material they do not corrode, which is a big advantage in terms of lifetime and maintenance. All ‘F’ turbines are constructed in a similar way, following a design by Hugh Piggott. They have a rotor of three wooden hand carved blades, a disc generator of two magnet rotors and one stator, a steel frame holding everything together and a tail that makes the machine face the wind. 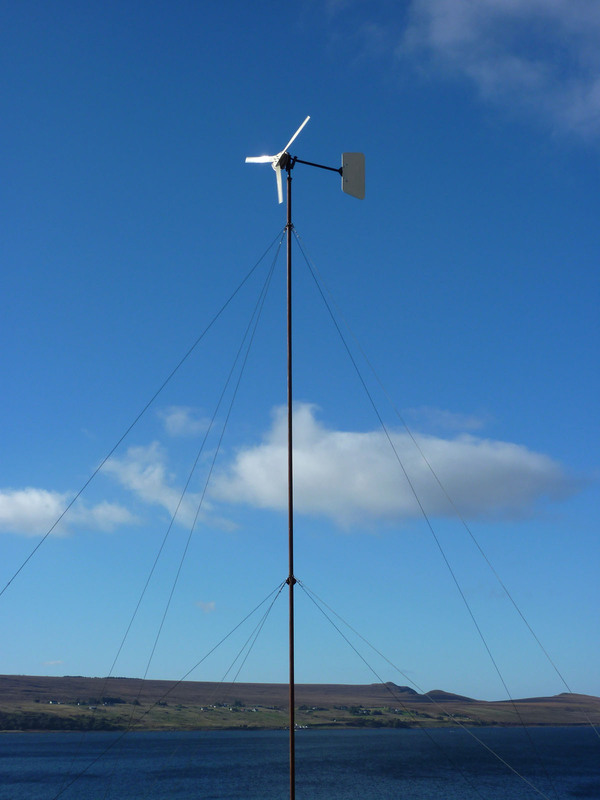 The tail also works as an overload control – when the wind speed rises too high for the turbine, it swings to the side and makes the whole machine “furl” out of the main wind direction, this is achieved by cleverly using mechanic forces and wind pressure only, no electronics involved. The rated power output of a wind turbine is the maximum power a wind turbine is designed to produce. This value will only be reached in high winds and is therefore not very informative. Much more important is the amount of energy produced over a certain period of time. The kWh numbers given above are calculated using an average wind speed. In reality, the energy production will be higher, because power in the wind rises with the cube of the wind speed. Therefore, deviations above the average wind speed will have a greater impact on energy production than deviations below the average. and so on… Modern datalogging devices can record this kind of data. Twice the diameter gives you 4 times more power. It also requires 4 times the strength of the construction and will cost more. Twice the wind speed will give you 8 times the power, at the same cost. Considering these laws of physics, it’s always better to have more wind (a higher tower or a better site) than a bigger turbine! Is it much “greener” to build a DIY wind turbine at home than buying a commercial one? This question is quite hard to answer. For a really accurate calculation of the environmental footprint, you would need to know all the energy used and all the co2 emitted while building the turbine. This also includes the manufacturing of the individual materials and their shipping. It becomes clear that it is difficult to get proper results. A definitive advantage of the DIY turbine is, that you are more flexible. You can chose the raw materials yourself and you’re also able to recycle a lot, if you have resources of second hand stuff. It’s not very hard to find scrap metal or other useful parts for a wind turbine. 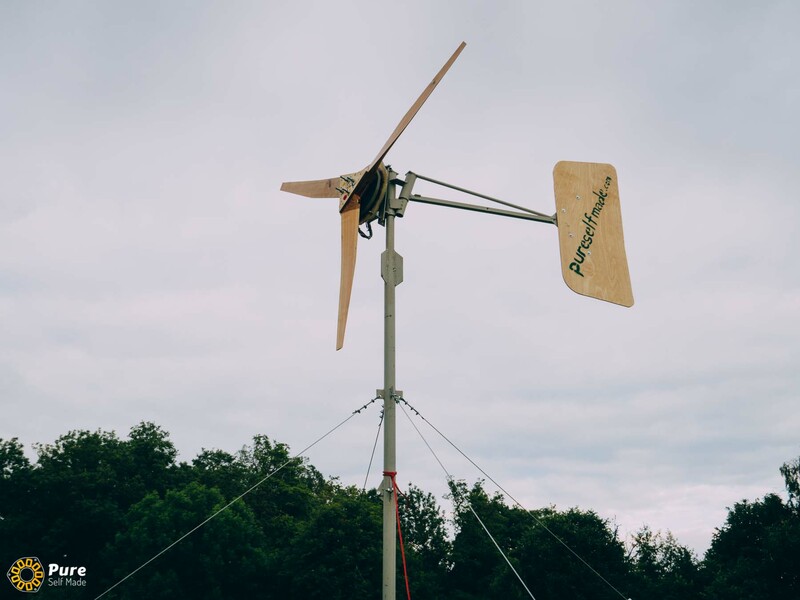 Everything you recycle is something that doesn’t need to be produced newly, so that saves a lot of energy and makes your DIY turbine ‘greener’. It’s worth considering the following:One kg of Aluminum for example takes about 50 kWh in manufacture and steel is not much different. The turbine needs to work quite a while to bring that back in. Recycling of materials makes the turbine’s footprint much smaller. It will definitely be much cheaper to build a wind turbine yourself than buying a commercial one, since DIY will eliminate all cost spent on marketing and labour. For example, the cost of materials for the 2F machine is 350€ – 400€. That’s for the turbine head only, any additional system components are not included. A commercial turbine of the same size would cost much more. It’s logical, that the cost of DIY things always varies with the source of materials. If you can find second hand steel on the scrap yard or you already got suitable wood lying around, it will save you some money. As far as energy production is concerned, the Piggott turbines can of course compete with commercial machines! And doing it yourself, you will gain a lot of experience and have fun as well. So if you ask me, doing it yourself is totally worth it! I try to provide the knowledge needed in my workshops. So when does it make sense to install a turbine? It’s definitely worth doing a bit of planning when it comes to small wind turbines as an energy source. The MOST IMPORTANT thing you need to run a turbine is WIND, of course! And that doesn’t just mean “we have a windy place here so it should be fine”. Your site should be exposed and you really need to have a fairly constantly blowing wind, without any obstacles around your turbine. If you have trees or buildings around and your turbine tower doesn’t really go way up above those objects, the air is very turbulent. This will cause a lot of wear on the wind turbine and will reduce the energy production significantly. I really like wind turbines and the way they work, but they only make sense in suitable locations. These things need to be said and to be considered. For findig out if your location is suitable, it makes sense to do some wind speed measurements over a longer period of time .There are also some sites where one can tell at a first look if the site is a good or a bad one (the balcony is a bad one for example). 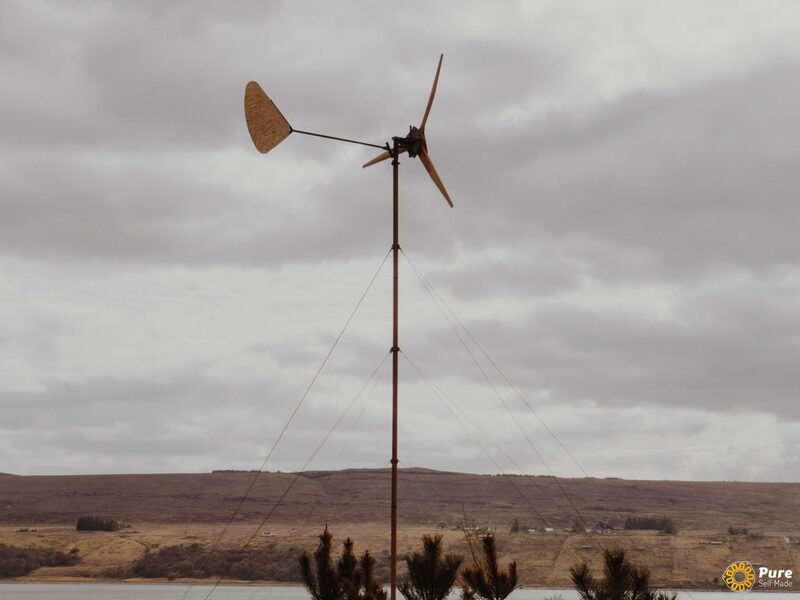 The good news is, that Piggott wind turbines have quite a broad range of use, because they can be built in all different sizes and system voltages, so they will fit most requirements, though still not all locations. In this case the setup will be a battery charging wind turbine configuration that either works on battery voltage and feeds straight into the battery of the system or has a controller (MPPT) to optimize performance. Typical situations are: Buildings in remote areas, installations in developing countries, remote communication systems,… Batteries are necessary to stabilize the system voltage and to provide your system with power if there is no wind. The energy can be used straight from the batteries as low voltage DC, but normally you will have an inverter that boosts the battery’s low voltage DC up to 230V / 50Hz AC (mains level) for your loads. That’s the way to go if you are not off-grid and want to use the turbine as a “green” energy source. In this case you will need a grid tie inverter that is connected straight to the wind turbine and feeds the energy into the grid. You normally will not need a battery in this scenario, although there are hybrid systems which have a battery as well, so you can run your system even if the grid drops out. In a grid connected system you can easily use way more energy than your turbine can produce – it will just come out of the grid. For this setup, the generator of the wind turbine needs to have the right output voltage for the grid tie inverter, so it is a good idea to know which inverter will be used in advance and make the generator windings in a way to fit the inverter’s needs. Also some kind of over-voltage protection circuit is needed to save the inverter from high voltages caused by the turbine in the case of failure. In general it makes sense to combine a small wind turbine with some photovoltaic panels (PV), because sun and wind are two resources which supplement each other very well. If there is a thunderstorm, there won’t be sun, but on a calm sunny day, there might be no wind…. I will extend this article & write more about this topics soon.